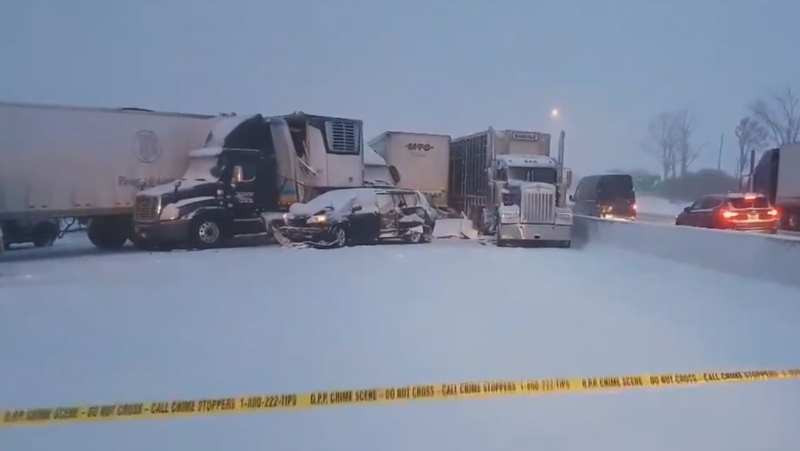 Snow squalls and blowing snow led to another day of traffic headaches on Wednesday, including a fatal, multi-vehicle crash on Highway 401. All westbound lanes were closed Wednesday afternoon at Foldens Line (Oxford Road 6) near Ingersoll for a multi-vehicle collision that OPP were expecting to cause an "extended closure." At least one person has died in that collision while a second motorist was taken to hospital with non-life threatening injuries. That was one of three multi-vehicle collisions in the area on Wednesday afternoon that happened within minutes of each other. There was a second crash just slightly to the east at Sweaburg Road, also in the westbound lanes of the 401, involving about 12 vehicles that closed the highway in that area. And a third crash involving another 15 vehicles was reported in the westbound lanes near the eastbound OnRoute, in between the other two crashes. Only minor injuries were reported the two subsequent crashes. 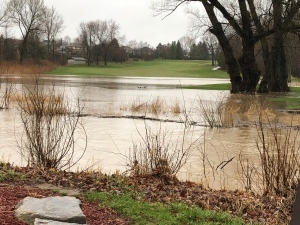 Drivers were being asked to avoid the area and heavy back-ups were being reported as westbound traffic was being forced off at Highway 2 into the south end of Woodstock. The closure is expected to last well into the early morning hours of Thursday. Another crash involving more than 20 vehicles in Milton, Ont. shut down the westbound 401 and left a massive traffic backup of several kilometres. OPP Sgt. Kerry Schmidt says some of the vehicles involved were blocking the shoulder, slowing clean-up efforts. Only minor injuries were reported in that collision. Meanwhile a transport truck crash on Highway 24 between Concession 2 and Burford-Delhi Townline Road north of Simcoe, Ont. closed that road for several hours. 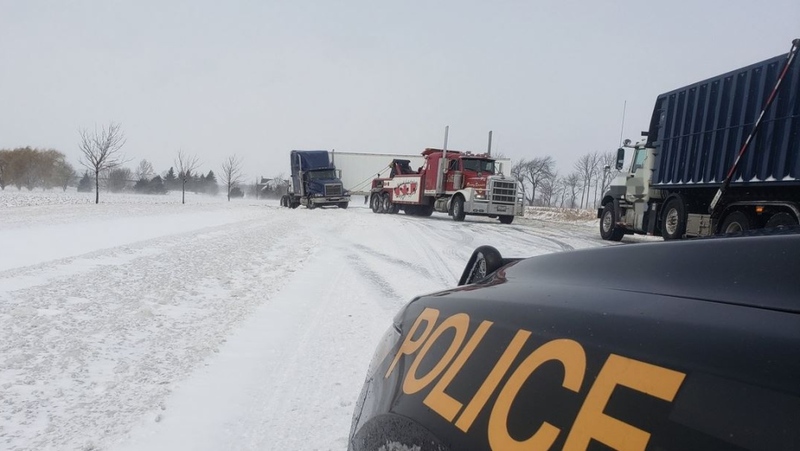 There were also numerous closures along Highway 401 throughout the day as well as smaller fender benders on city and county roads. 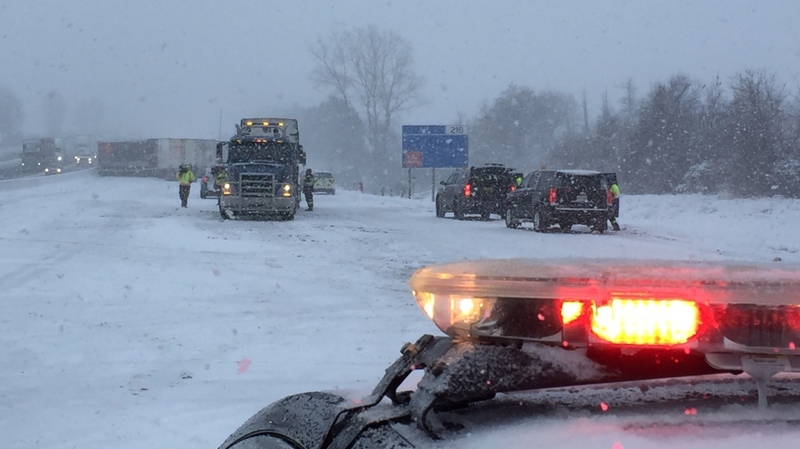 Most of the crashes are being at least partly attributed to poor visibility from snow squalls and blowing snow and very slippery road conditions, but investigations into the cause of each continue. Students in the counties who rely on school buses had another snow day Wednesday, while buses within London were running as scheduled. Freezing rain in the region gave way to snow overnight and then blowing snow, which made travel hazardous. 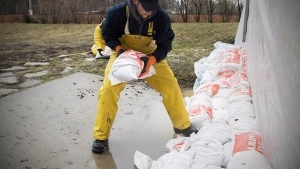 All buses have been cancelled in Middlesex, Elgin, Oxford, The Red Zone and some routes in Huron-Perth.